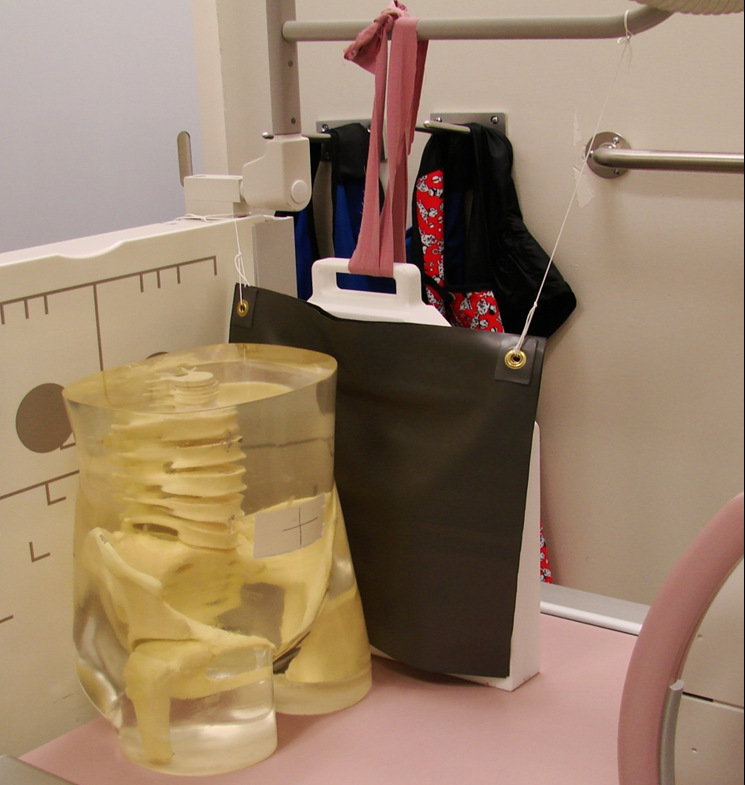 A few years ago I was in charge of choosing and purchasing the lead aprons used in our radiology department. We had one main vendor we used so I contacted them about getting a bunch of front sided and wrap around aprons as well as half shields of different sizes. As you may or may not know, the usual choices of lead apron thicknesses are .25mm, .375mm and .5mm. We had always purchased the .5mm figuring that thicker is better for radiation protection, but also heavier and less comfortable. I was told by the rep (whose territory was the entire state of California) that 95% of the lead aprons she sold were .25mm. When I asked if they worked as well as the .5mm aprons I was told that she didn’t know. When I asked if other hospitals had inquired about the differences I was told “no, they hadn’t”. To which I replied “Huh – are you kidding”? But they weren’t. Then she remembered that someone years ago had done an experiment comparing the different thicknesses. She found the report and sent it to me. 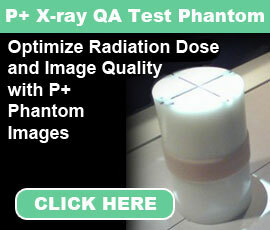 As I remember, it stated that the .25mm blocked 90% of the radiation at 80kV, the .375mm blocked 93% and the .5mm blocked 96%. When I asked what the difference was between 90% and 96%, I was told that they didn’t know. 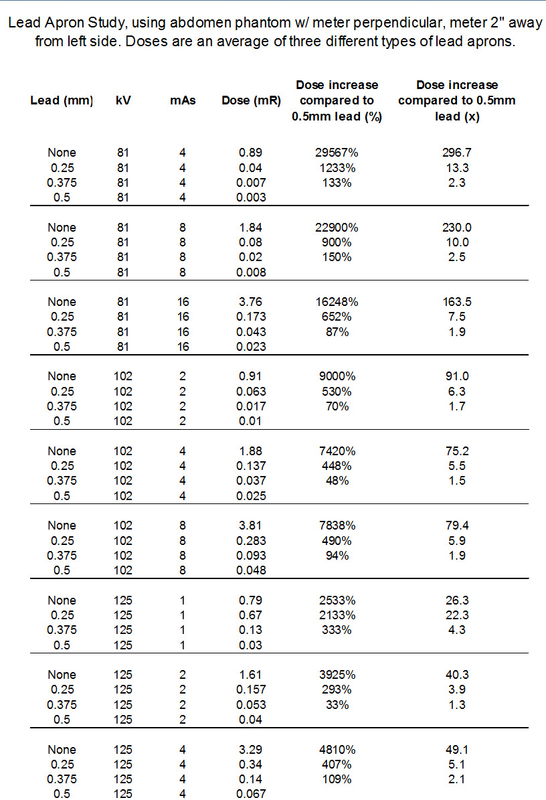 It was obvious that more lead meant more protection, but what did 3% or 6% mean? So at this point I realized I just needed to do my own experiment to see what the differences were. I had that company and one other major manufacturer of lead aprons send me sheets of their lead in the 3 thicknesses. Now I was ready to begin. As you can see in the first image I used my abdomen phantom as the patient. The tube was at 40” SID and collimated to a 12” x 12” to simulate the average Image Intensifier (II) beam. Next to the abdomen I placed my white DUKE phantom because it so heavy I knew it would move (it’s backwards so you don’t see the lungs, ribs and heart). 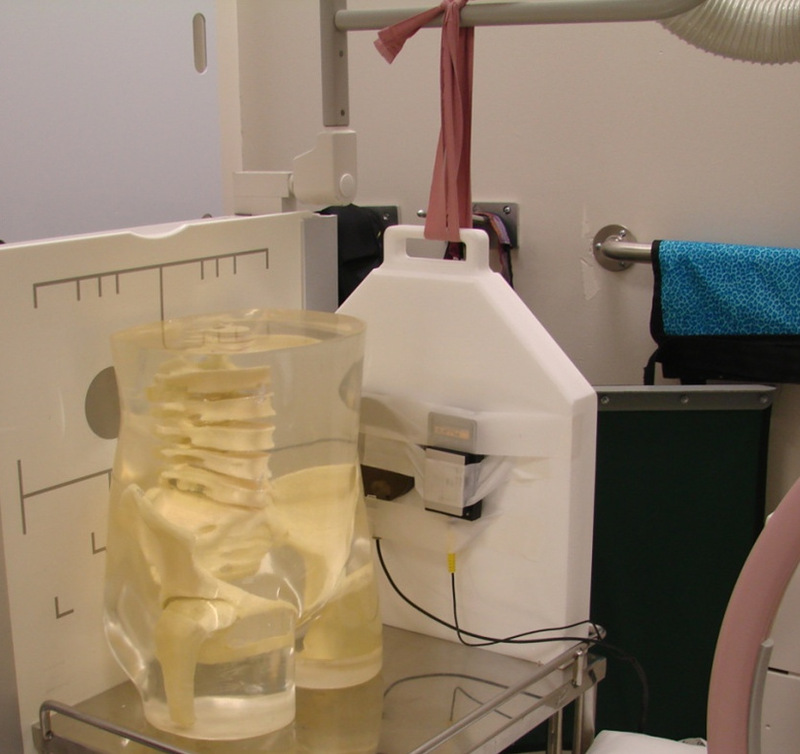 I taped on my 125cc ion chamber and kV meter and made sure the ion chamber was as close as possible to the patient. It turns out I didn’t really need to the kV meter for this experiment but I didn’t know it at the time. Then I started making exposures. I had decided to use 3 different kVs to best reproduce the kV that an II uses. I used 81, 102 and 125 kV. With each kV I also picked 3 different mAs’ and these were different depending on the kV (less mAs was used as the kV increased). Once I had made all of the exposures with no lead covering the ion chamber I now had my base numbers that would be used for all the comparisons. Then I did the entire experiment 3 more times. Once with the .25mm lead covering the ion chamber, again with the .375mm lead and finally with the .5mm lead. The chart below shows all of the exposures made. 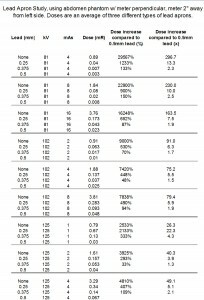 Just click on it to enlarge and if you want to print it please refer to chart 45-lead_apron_study (in All Charts) which will be easier to view. As you can see there was never a point that the .25 was better than the .375 or that the .375 was better than the .5. There was one time when the .375 lead only let through 1.3 times (33%) more radiation than the .5 (see the lower line in red – 125 kv@ 2 mAs). Another time the .25 lead let through 22.3 times (2133%) more radiation than the .5 (see the higher red line 0 125 kV @1 mAs). So to summarize, the thicker the lead, the more it protects you. Always!!! If your lead apron feels light and comfy, it most likely isn’t 5 mm and there’s a good chance that more radiation than necessary is getting through. Thank you for all your hard work as this is the exact article I was looking for to present to our department head concerning .5 vs .35 lead aprons. I was wondering if you did any tests where the lead aprons were further than 2 inches away from the primary beam? When considering or factoring in divergence and the inverse square law it would seem to me that the actual dose levels would be much lower at 2 feet (or more) than at 2 inches. I understand the point of your study and I do agree with the results that more lead is better but… at a distance (following the three cardinal rules), just how much better? At a distance of two inches similar concerns could be made with a light bulb (I’m using a very loose example here) that burns could occur if the proper protection wasn’t used. Another solution would be to not put your hand too close to the bulb. Please don’t think I am bashing your study, I’m not, and I know x-rays are much different than heat from a light bulb but I am presenting the argument to purchase .35 lead aprons for our department and I want to be able to present an honest argument, not just one based on what I think or what all the other guys are doing or solid facts based on situations that rarely occur. . Thanks for your comments and question. I did a similar test, but unfortunately only tested a .25 to a .5 and I skipped the .375 as we barely have any of those aprons at our hospital. To see this experiment go to my Significant Experiments and look up the one titled “Comparison of .25 and .5mm Lead Aprons & 90 and 60 degrees of Scattered Beam”. It shows that the .25 are not even in the ballpark of the .5. It’s not the exact proof you need, but it sure shows that nothing shields as god as a .5 apron. Thank you but I will keep writing my own articles unless I see one from a colleague that I know would be perfect for my site.